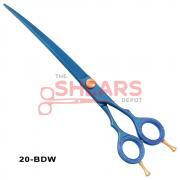 Buy Any 3 Dog Grooming Shears for $100 Only! Order via Phone....Special offer. Free Shipping!!! 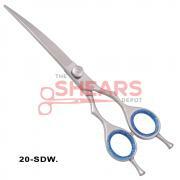 At The Shears Depot we carry many kinds of hair scissors for your pet grooming needs. 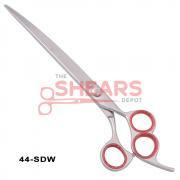 Our pet grooming scissors are made of a high grade stainless steel and come in different sizes and styles. You can purchase Raphil pet grooming shears along with a free scissor case and your choice of color inserts not to mention the free shipping you get on top. Buy your Raphil pet grooming scissors and shears from The Shears Depot and pamper your pet. We carry dog grooming thinning shears and dog scissors for pets, haircutting scissors and dog grooming shears for pet grooming. Pet groomers can use our online store to purchase their pet grooming scissors online and enjoy the reduced prices that exist on our online wholesale outlet. You will find the Raphil grooming shears in different kind of finishes i.e. Mirror polish finish hair scissors, Rainbow finish pet grooming scissors and Blue Titanium finish pet grooming scissors. OurRaphil pet grooming scissors are most commonly used for grooming of different kind of pets but most commonly dogs, cats and horses. 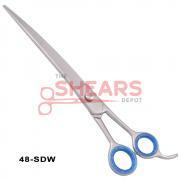 Buy 3 Dog Gromming shears for $100 only with Free Shipping! Order via phone. Description: Mirror polish professional dog grooming shear with a swivel thumb. Made of high grade Japanese Steel. Available at a great price! 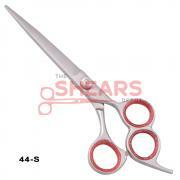 Description: Excellent quality dog grooming shear. Three finger holes having a swivel thumb for ergonomic use. Available at a great reduced price here. 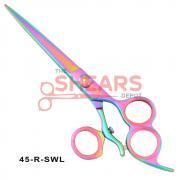 Description: Rainbow finish professional dog grooming shear with a swivel thumb for ergonomic use. Made of excellent quality high grade Japanese steel. Available at a great reduced price! Description: Professional grade mirror polish dog grooming shear with an offset. Made with high grade Japanese steel. Excellent price offer! Description: Excellent quality professional dog grooming shear with rainbow titanium finish. Excellent price offer! 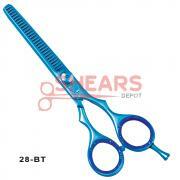 Description: Excellent quality straight blade blue titanium finish dog grooming shears. Made of J2 420C Japan Steel. 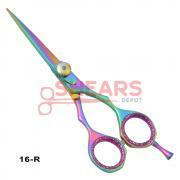 Description: Excellent quality Rainbow finish professional dog grooming scissors. Made of J2 420C Japan Steel. Description: A very nice and comfortable dog grooming shear for the professional groomers as well as pet owners. Made of J2 420C Japan Steel. Available at a great price!!! 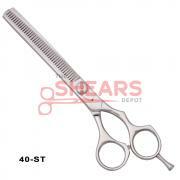 Description: Superb quality dog shears for professional grooming needs. Made of J2 420C Japan Steel. Description: Excellent quality rainbow finish dog grooming shears with a rainbow multicolor finish. 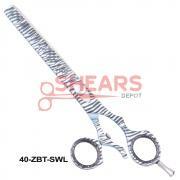 Description: Excellent quality professional dog grooming shears made with J2 420C Japan Steel. 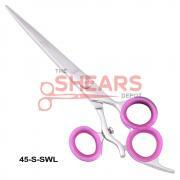 Description: An excellent quality 440C Japan Steel Hair cutting Scissor. Available with Free Case + Free Shipping & Free Color inserts of your color choice. 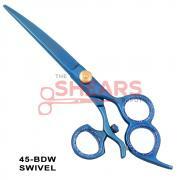 Description: A very nice grooming scissor with a broad cutting blade. Excellent quality available as always at an amazing price with us! 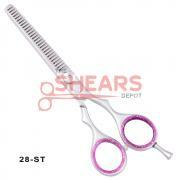 Description: A very nice look hair scissor with 3 finger holes that provide extra stability to the groomer. This shear is a workhorse. Excellent price offer! 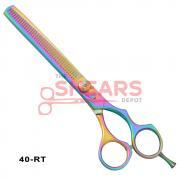 Description: Excellent quality rainbow multicolor dog grooming shears. Made of J2 420C Japan Steel. 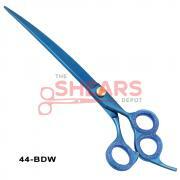 Description: This dog grooming shear is a workhorse. An absolute delight to work with for the professional groomer. Made of J2 420C Japan Steel in a blue titanium finish. 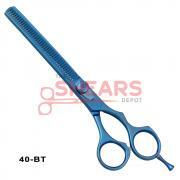 Description: Down curve blue titanium long size hair scissors. Description: Professional grade dog grooming scissor in a blue titanium finish color and a down curved blade. Has a swivel thumb for extra comfort during cutting. Being offered at a great lowered price. Description: Professional grade Rainbow finish Dog Grooming Scissor with a down curved blade and a swivel thumb for comfortable cutting. Free Shipping! A great buy! 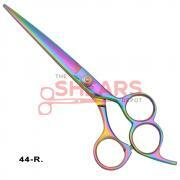 Description: Beautiful looking, excellent quality professional dog grooming shears in a rainbow multicolor finish. Made of J2 420C Japan Steel. Description: ACE Curve excellent quality razor sharp hair scissor with a downward curved. Free shipping! 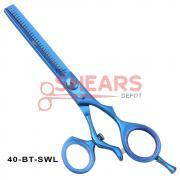 Description: Down curved blue titanium finish J2 420C stainless steel dog grooming shear. Available in sizes 7", 8" & 9". Description: Mirror polish finish 3 ring down curved stainless steel dog grooming shears. 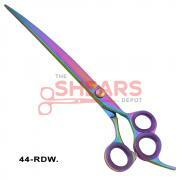 Description: Rainbow finish dog grooming shears down curved Japanese stainless steel. 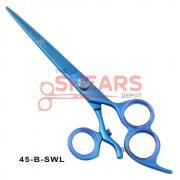 Description: Magnificent quality professional down curved dog grooming shears in a beautiful blue titanium finish. Made of professional grade J2 420C Japan Steel. Description: Excellent quality professional dog grooming shears in a mirror polish finish. Made of J2 420C Japan Steel. 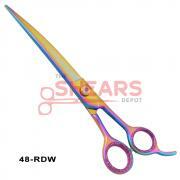 Description: Excellent quality professional dog grooming shears in a rainbow multicolor finish with a down curved blade. Made of J2 420C Japan Steel. 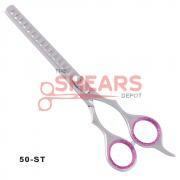 Description: A very nice looking dog grooming shear with a safety tip for extra protection during pet grooming. Comes in a mirror polish finish. Made of J2 420C Japan Steel. Description: A beautiful looking rainbow multicolor dog grooming shear with a safety tip for extra protection during pet grooming. Made of J2 420C Japan Steel. Description: Excellent quality professional dog grooming shears with a safety tip. Made of excellent quality J2 420C Japan Steel.